LiveStore | The complete real-time reporting & loss prevention solution for retail. Using your existing in-store systems and network infrastructure, LiveStore delivers up-to-the-minute information to drive enhanced sales and profitability across your retail estate. The timely provision of relevant information underlies the LiveStore solution, delivered to your desktop, laptop, tablet or mobile in simple to use reporting dashboards. Why wait until the close of business or end of week to understand how your business is performing? With no need to upgrade your POS hardware and software or in-store networks and external connectivity, LiveStore seamlessly integrates to unlock the inherent potential of your existing retail infrastructure to provide the right information when you need it most. 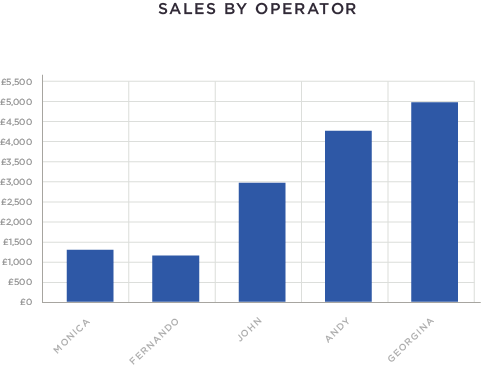 Monitor sales and turnover in real-time nationally, regionally or store by store. Track performance against KPI’s minute-by-minute or follow the effectiveness of promotions against marketing spend. But don’t be over faced by data! LiveStore lets you decide what you want to see and when you want to see it. The LiveStore policy engine lets you set the thresholds and can be configured to send out instant alerts via email or text guaranteed to get your attention. Equally, LiveStore collects all POS data and activity for future reference and mining, so you have the flexibility of combining live need- to-know performance activity with more considered traditional reporting. LiveStore integrates with existing CCTV and DVR installations alongside the EPOS to deliver a unique loss prevention solution exploiting all its real-time capabilities. 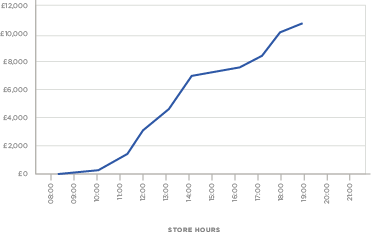 LiveStore identifies anomalous, potentially suspicious or out-of-policy transactions as they occur. What sets the LiveStore solution apart is its ability to capture and package related video and other contextual information around a transaction event in real-time for access remotely anywhere, at any time. Physically see the transactions you want to see in your reporting dashboard in the most cost effective and timely manner. The powerful LiveStore policy engine forensically filters transactions, patterns of transactions or other events in-store to provide an irrefutable audit trail of user behaviour, paramount in determining retail shrinkage. Not to be confused with EPOS and video overlay or synchronisation, LiveStore turns your existing security hardware and IT into a truly smart system. Don’t waste time trawling through hours of video on-site or travelling to outlets where you think you have a problem, let LiveStore send out notifications with video attachments around the parameters you have already set. LiveStore is highly efficient in its use of bandwidth so there is no need to upgrade store networks. 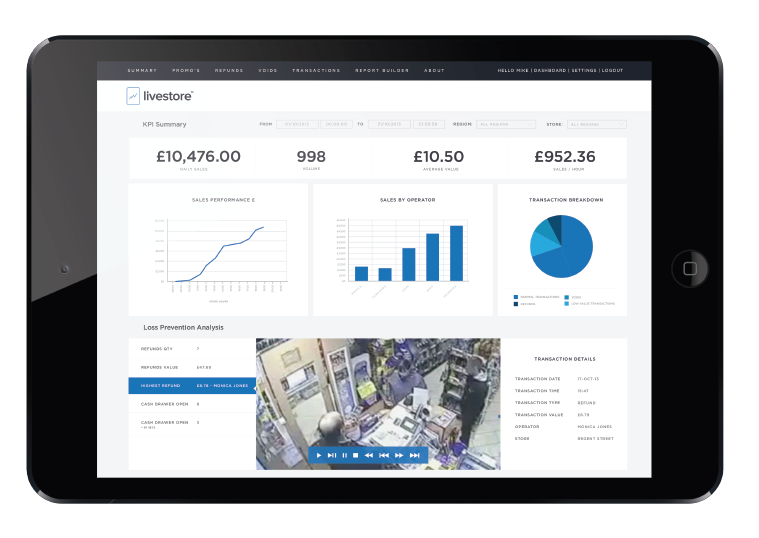 Return on Investment is rapid and through integration with an existing physical security estate LiveStore provides an added return on the investment already made in your in-store CCTV. Until now the concept of introducing a cost effective layer of real-time operational management across a retail estate has been nigh on impossible. But with LiveStore at the very heart of your in-store systems you open up a whole new paradigm of monitoring and reporting. The light touch LiveStore agent and data gateway are capable of handling data feeds from almost any retail peripheral technology or platform - from RFID, barcode, access control and building/environmental monitoring systems to stock control and ‘back-door’ deliveries. Accessing real-time information and then monitoring feeds alongside live performance information provides new levels of operational insight. For example, LiveStore integrates with the new generation of intelligent cash handling systems to provide an up-to-the-minute understanding of the in-store cash position. Or combining LiveStore with video analytics technology gives a higher level operational understanding at an EPoS conveyor. Operational efficiency is also achieved through the same functionality afforded by the LiveStore loss prevention solution, using the real-time monitoring capabilities with CCTV images as a powerful staff training tool. Remotely accessible via its dashboard reporting module, LiveStore provides video lead-in and lead-out sequences to help understand all the actions of an employee around an individual sale and to help promote positive behaviour in line with company policy. The devil is in the detail….and the detail is in the data. In these days of data proliferation the sheer scale of information can be more ‘foe’ than ‘friend’. LiveStore has been designed to both scale and simplify access to large amounts of data. 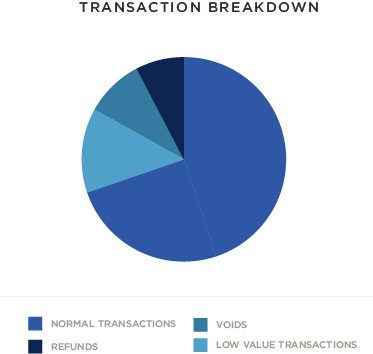 Quite apart from the additional contextual information such as CCTV for specific events, LiveStore captures all transaction data from the EPOS system and thereby provides value as both a live monitoring system and a definitive source of data for future report building and traditional mining. LiveStore is a future-proof system that provides all the benefits associated with existing data mining and reporting but with levels of integration at store level that open up a new era of real-time business intelligence. LiveStore is an agent-based software solution deployed in-store as a data gateway capable of integration within the store architecture in a variety of different ways. LiveStore is designed to have zero impact on the in-situ EPOS system and overall retail operations. The LiveStore team of experienced solutions consultants and developers will advise on the most appropriate and cost effective manner of integration with existing retail hardware and software and, where necessary, provide bespoke interfaces. Our LiveStore support team is available 24/7. LiveStore is brought to you by Vigilant Applications Limited a UK based software technology house specialising in high-end security applications focused on transaction monitoring, information security compliance and contextual information surrounding user behaviour. Our patented technology is also deployed in non-retail environments including UK Police forces and within the Financial Services industry including banks, hedge funds and brokers. Access to and use of this website is subject to these terms and conditions. By using this website you agree to these terms. These terms and conditions may change at any time, and by continuing to use the website, you agree to such changes. This website is operated by or on behalf of Vigilance Applications Limited a company registered in England and Wales, Company Number: 08087397, registered office: c/o 7 Gardiner Close, Abingdon, Oxfordshire OX14 3YA. Our VAT number is: GB 135 3684 09. Changes to these terms and conditions will only be notified by replacement of this page and the privacy statement page from time to time. The content of these web pages is copyright Vigilant Applications Limited 2012 except where otherwise stated. All rights are reserved. Unless we agree otherwise you may only print or copy items for your temporary personal use. Permanent copying or storage of any pages or any part of these pages or the re-distribution by any means is not permitted. You may not use our trade marks, or link to our website, without prior written permission. The information given in this site is provided for information only. Whilst we try to ensure that all information on the website is accurate, we cannot be held responsible for any statement on the website or any reliance upon it. Any description of products and services is only an invitation to treat and not an offer capable of acceptance at law. Although anti-virus software is used to scan the website content, we cannot guarantee that any downloads are free from viruses. We strongly advise you to take your own anti-virus measures when downloading any content. As a condition of your use of this website you agree not to transfer to our website any material which is obscene, misleading, inaccurate, defamatory or in breach of any copyright or that will cause any damage to data, software or the performance of any computer system. We are governed by the laws of England and Wales in relation to personal data collected by us on individuals who reside in the European Union. We respect personal data privacy on all personal data we collect. To read our full privacy statement, click here. The content on our website may contain links to third party sites. We do not control these websites and therefore cannot advise you on the content or nature of third party privacy policies. You should read the relevant privacy policies posted on any third party sites. We have no control over the content on external third party sites and consequently do not accept any liability arising from their use. Use of this website is governed by the laws of England and Wales. USE OF THIS SITE IS AT YOUR SOLE RISK. ALL MATERIALS, INFORMATION, PRODUCTS, SOFTWARE AND SERVICES ARE PROVIDED "AS IS," WITH NO WARRANTIES OR GUARANTEES WHATSOEVER. VIGILANT APPLICATIONS LIMITED EXPRESSLY DISCLAIMS TO THE FULLEST EXTENT PERMITTED BY LAW ALL EXPRESS, IMPLIED, STATUTORY, AND OTHER WARRANTIES, GUARANTEES, OR REPRESENTATIONS, INCLUDING, WITHOUT LIMITATION, THE WARRANTIES OF MERCHANTABILITY, FITNESS FOR A PARTICULAR PURPOSE, AND NON-INFRINGEMENT OF PROPRIETARY AND INTELLECTUAL PROPERTY RIGHTS. WITHOUT LIMITATION, VIGILANT APPLICATIONS LIMITED MAKES NO WARRANTY OR GUARANTEE THAT THIS WEB SITE WILL BE UNINTERRUPTED, TIMELY, SECURE, OR ERROR-FREE. YOU UNDERSTAND AND AGREE THAT IF YOU DOWNLOAD OR OTHERWISE OBTAIN MATERIALS, INFORMATION, PRODUCTS, SOFTWARE OR SERVICES, YOU DO SO AT YOUR OWN DISCRETION AND RISK AND THAT YOU WILL BE SOLELY RESPONSIBLE FOR ANY DAMAGES THAT MAY RESULT - INCLUDING LOSS OF DATA OR DAMAGE TO YOUR COMPUTER SYSTEM. IN NO EVENT WILL VIGILANT APPLICATIONS LIMITED BE LIABLE TO ANY PARTY FOR ANY DIRECT, INDIRECT, INCIDENTAL, SPECIAL, EXEMPLARY OR CONSEQUENTIAL DAMAGES OF ANY TYPE WHATSOEVER RELATED TO OR ARISING FROM THIS WEB SITE OR ANY USE OF THIS WEB SITE, OR OF ANY SITE OR RESOURCE LINKED TO, REFERENCED, OR ACCESSED THROUGH THIS WEB SITE, OR FOR THE USE OR DOWNLOADING OF, OR ACCESS TO, ANY MATERIALS, INFORMATION, PRODUCTS, OR SERVICES, INCLUDING, WITHOUT LIMITATION, ANY LOST PROFITS, BUSINESS INTERRUPTION, LOSS OF PROGRAMS OR OTHER DATA, EVEN IF VIGILANT APPLICATIONS LIMITED IS EXPRESSLY ADVISED OF THE POSSIBILITY OF SUCH DAMAGES. THIS EXCLUSION AND WAIVER OF LIABILITY APPLIES TO ALL CAUSES OF ACTION, WHETHER BASED ON CONTRACT, WARRANTY, TORT, OR ANY OTHER LEGAL BASIS. Vigilant Applications Limited is responsible for the processing of any personal information you provide during your visit and interaction with this website. Vigilant Applications consider the privacy of users of our website extremely seriously. The purpose of this statement is to set out how we use personal information we may obtain about you. In order to provide you with a range of services, including the downloading of resources such as datasheets and whitepapers, we may collect personal information from this website. This information may include your name, address, email address, telephone number, any other information you provide to us. We may supplement the information you provide to us with information that we receive or obtain from other sources. to protect our users and ourselves. Information that you provide or that is obtained by Vigilant Applications Limited as a result of your use of this site, will be used by Vigilant Applications Limited for analysis to enable us to develop and improve the website and the services we offer and to enable us to provide you with information which we think may be relevant or of interest. In addition to information connected with services you have requested, we may contact you (by e-mail, telephone, mail or otherwise) with other information and about other products and services (including those of other companies and organisations) which we consider may be of interest to you. If you do not wish to receive this additional information you can opt-out by notifying us at any time by e-mailing info@vigilantapplications.com or mail to Head of Communications, Vigilant Applications Limited, Abbey House, 1650 Arlington Business Park, Theale, Berkshire, RG7 4SA, United Kingdom. In order that we can monitor and improve the site, we may gather certain information about you when you use it, including details of your domain name and IP address, operating system, browser, version, and the website that you visited prior to our site. We may do this by way of a cookie as described below. Most web browsers automatically accept cookies. You do not have to accept cookies, and you should read the information that came with your browser software to see how you can set up your browser to notify you when you receive a cookie. This will give you the opportunity to decide whether to accept it. Refusing cookies may mean that you cannot access certain features of the Vigilant Applications Limited website. In order to provide you with the products and services you have requested, we may need to transfer your personal information to countries outside the European Union which may not protect your personal information as extensively as the United Kingdom. If we do so we will keep control of the information or require anyone to whom we pass it to treat it in accordance with UK data protection standards. We endeavour to take all reasonable steps to protect your personal information but cannot guarantee the security of any data you disclose on-line. Please note that email is not a secure medium, and should not be used to send confidential or sensitive information. You accept the inherent security risks of providing information and dealing on-line over the Internet and will not hold us responsible for any breach of security unless this is due to our negligence or wilful default. You have the right to receive information about the personal data (as defined in the Data Protection Act 1998) we maintain on you upon written request and payment of a fee. If you are concerned that any of the information we hold on you is incorrect please contact us.